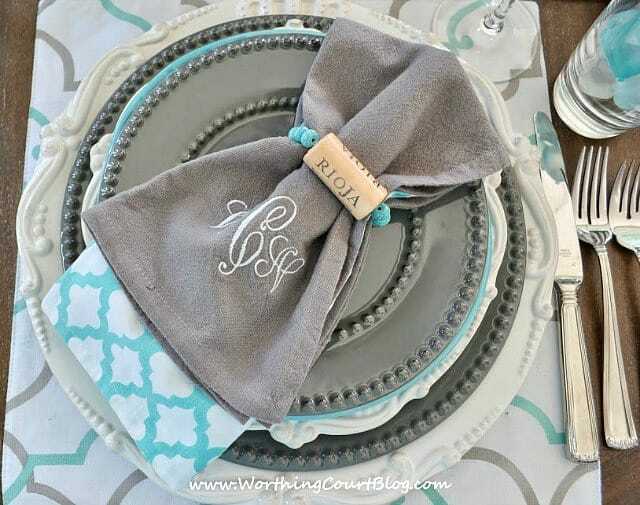 When I photographed my friend, Nancy’s, gorgeous gray and turquoise tablescape I was smitten with the napkins rings! Thankfully, Nancy agreed to show me how she made them. A few days later, I was back at her house with my supplies in hand. Much to my surprise, these were very easy to make! Drill a hole completely through the cork, from end to end. 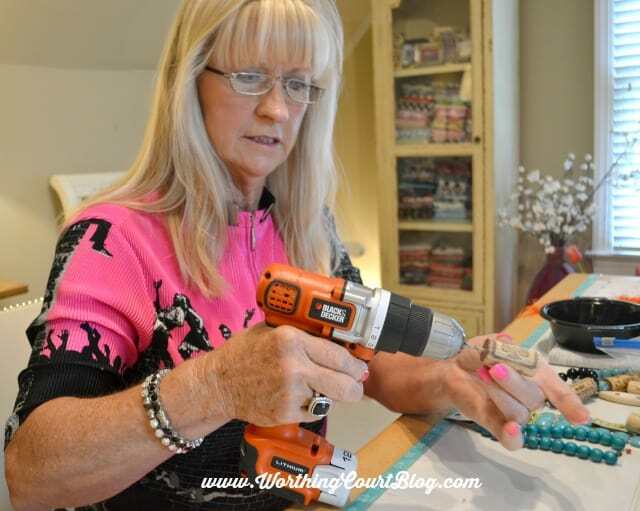 Do your best to center the hole and keep the drill straight as you’re drilling through the cork. Thank you, Nancy, for being my model! Paint the cork with Polycrylic. Make sure to get some Polycrylic down into the holes on each end. 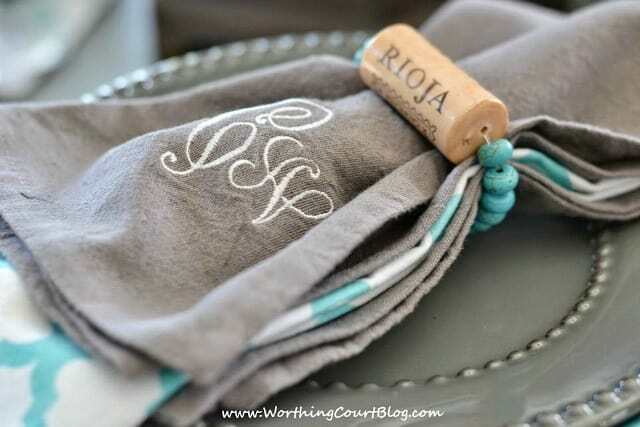 This will help prevent the cork from chipping away as the napkin rings are used. 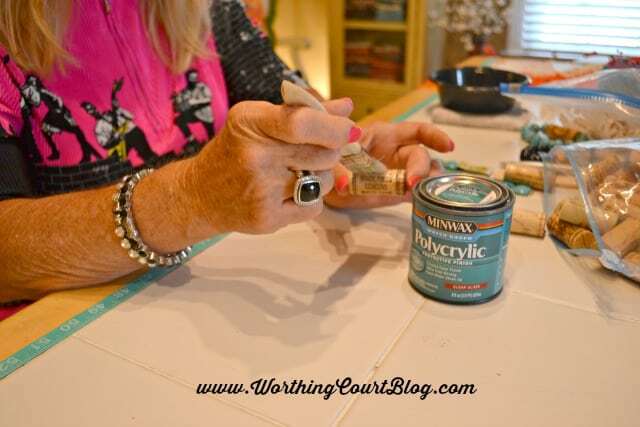 Allow the Polycrylic to dry completely before continuing work on the napkin ring. Separate the beads from their packaging. Pull a length of stretch cord, several inches long, from the roll. Do not cut the cord. Thread about half of the beads that you need for the napkin ring onto the length of stretch cord. 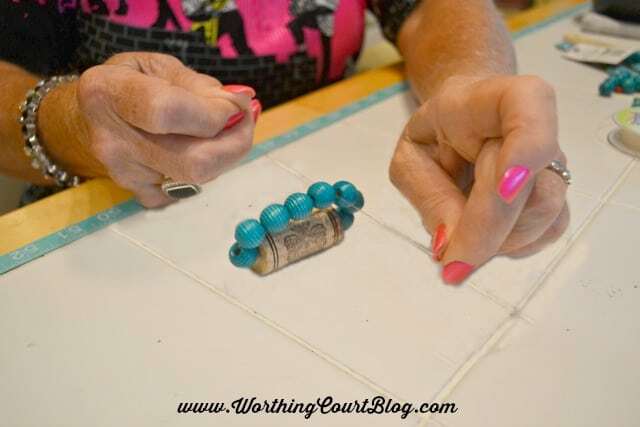 The number of beads that you use depends upon the size of them. My beads were a little large, so I used five of them for the first half and four for the last half, for a total of nine beads. 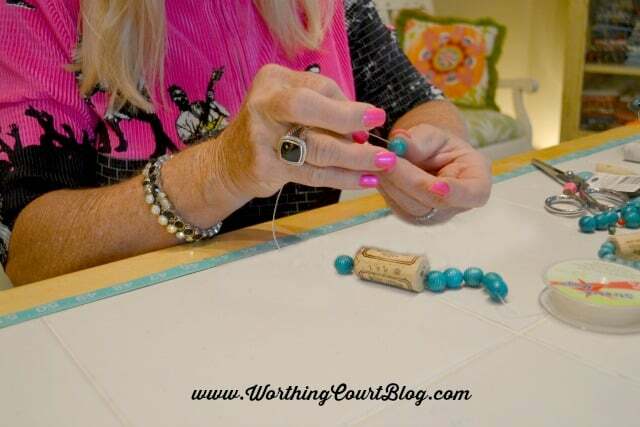 Thread the cork and the other half of the beads onto the stretch cord. Without cutting the stretch cord, tie it together in a knot. The knot will be hidden between the beads. After the knot has been tied, cut the cord and clip the ends close to the knot. You can add a drop of glue to the knot if you think it’s necessary. We chose not to use any glue and didn’t have any problem with the knot slipping or coming untied. 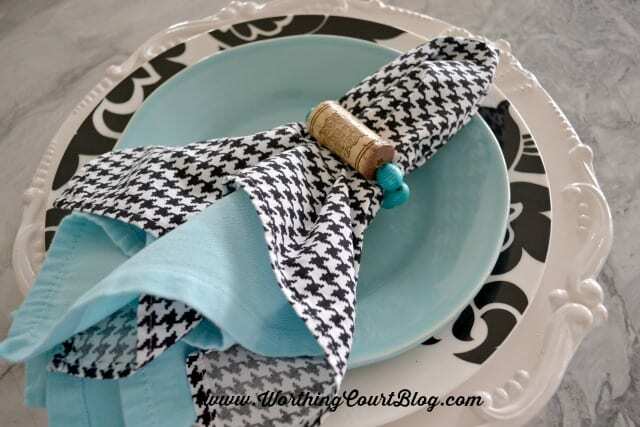 We played around a little bit with different napkins, napkin rings and dishes to give you an idea of how the napkin rings work with different table settings. 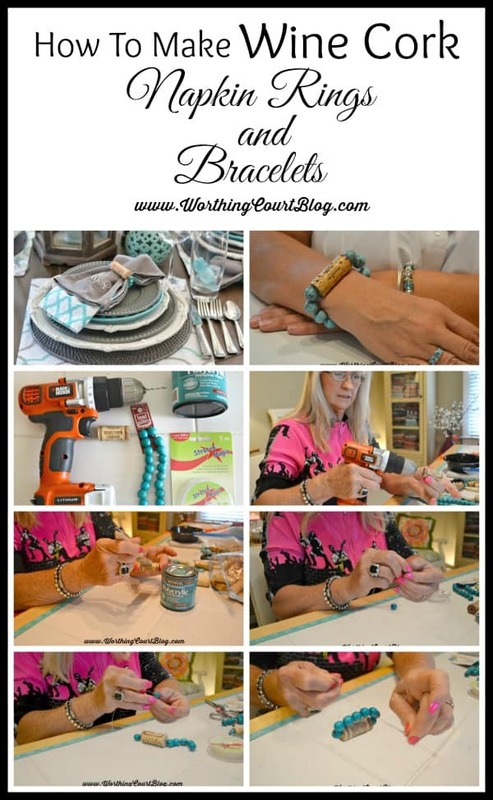 When we were finished with the napkin rings, we made a couple of bracelets too. We used the same method, but used larger beads. Cute, huh? 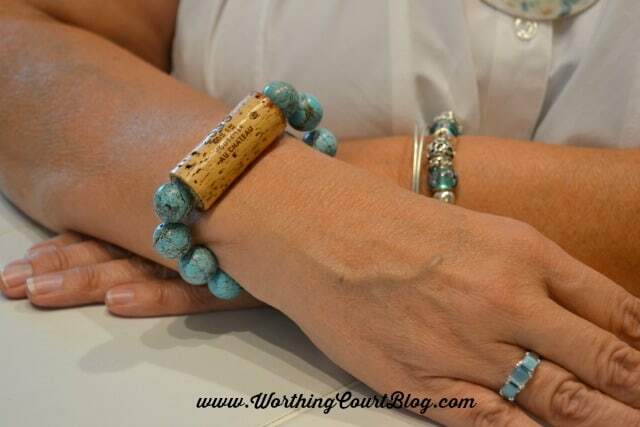 I can’t wait to make some more using different colors and shapes of beads! 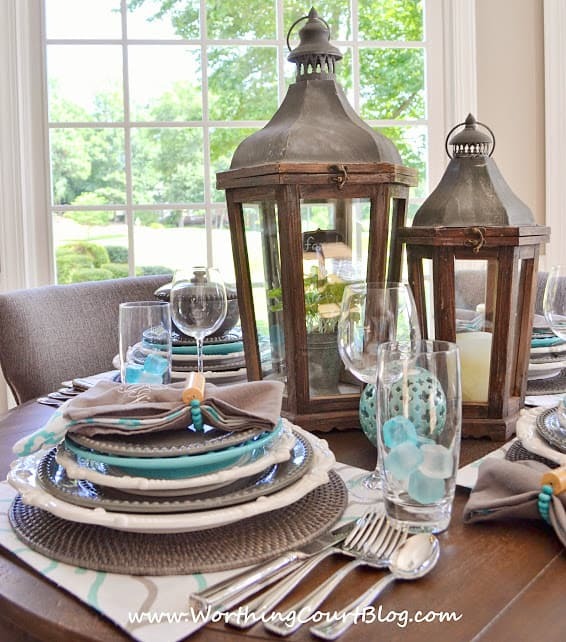 Click HERE to see the rest of her beautiful turquoise and gray tablescape. HaHa! That was my thought too, Sheila. 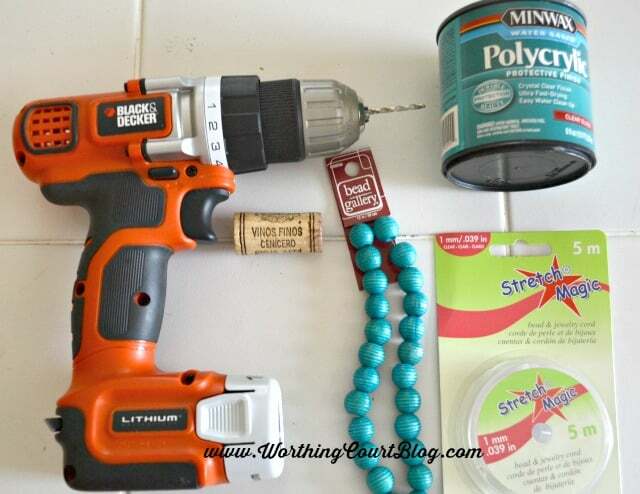 I just bought some beads at Michaels, can’t wait to try this. Hi Betsy. I’m glad to hear that you’re going to give them a try. I’d love for you to send me a photo to share on my Facebook page after you’ve made some. Let me know if you have any questions. Hey, I really love these! I posted these on my FB page and received great feedback. I host art events at a winery and do a “lifestyle and design” segment for a TV show here in Roanoke. I would love to share this idea on the show in the fall. I think it is the perfect combo of what I do here. What do you think? Hi Lindee. It sounds like this craft would be a perfect fit for your tv segment and/or the arts event at a winery. I have no problem at all if you share this idea. I would appreciate a mention of where you got the idea though! Thank you so much for checking with me. Hi Jennifer. That’s one of the cool things about this project! Thanks for stopping by. These are so cute! What a clever idea. 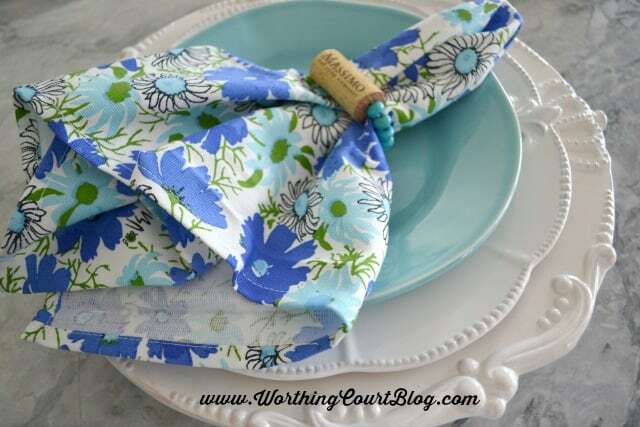 I’d love for you to share them at my Twirl & Take a Bow Linky Party. 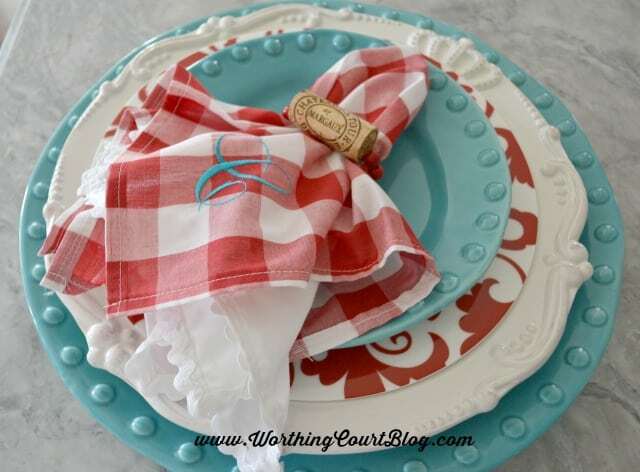 http://www.houseontheway.com/twirl-take-bow-party-103/ We would love to have you join the fun! This is a great idea and I will certainly pin this. Now I I’ll be drinking more wine! Ooooh! I can’t wait to try these!!! They are really cute and versatile! I am heading to the craft store today as a matter of fact and will definitely be picking up supplies! Thank you for a great idea!